Baby Glider Gallery - The Comfort Store! When it comes to providing the comfiest, coziest and sturdiest nursery gliders around – we at Glider Gallery are the experts. Every new mom deserves a special a haven, a comfortable place for midnight feedings, baby bonding times and just plain relaxing. Whether Mom needs a rocker or glider for the exquisite new baby nursery, the master suite or even the living room, rest assured that our glider will be hottest new hangout in the house. We, at Glider Gallery, work closely with manufacturers to bring you a variety of unique choices, at prices that fit every budget. From Rocking Chairs to Wooden Gliders, to fully upholstered nursing chairs, we bring you a wide array of great products in a full range of colors. We handpick and seat test our chairs, making sure they’re designed for optimum comfort and support. All our rockers and gliders are designed with comfortable backs to support Mommy during those late night feedings as well as high arm rests to assist Mommy during nursing. And just incase your wondering – No! We are not only about baby feedings. 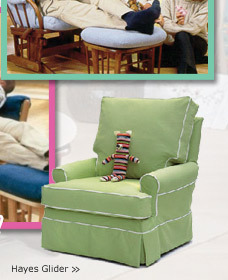 When baby gets too big for mommy’s lap, all our chairs easily transition into the family room. 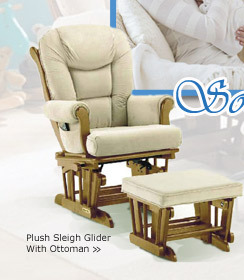 Glider Gallery is synonymous with comfort. Just try one of our gliders and you’ll now why.